The PinkAway Halotron™ treatment unit is the centerpiece of the Commercial Pink Away Treatment System and is a computer controlled treatment device used to eliminate Pinking on marine vinyl fabric. The Halotron™ uses a powerful patent pending narrow spectrum light and environment control system that, along with the PA-18 treatment agent, penetrates all layers of the vinyl to eliminate Pinking. It is rugged, light weight and easy to use. One Year Warranty: Gestalt Scientific Corporation is responsible for defects in materials and workmanship for one year after date of original purchase. 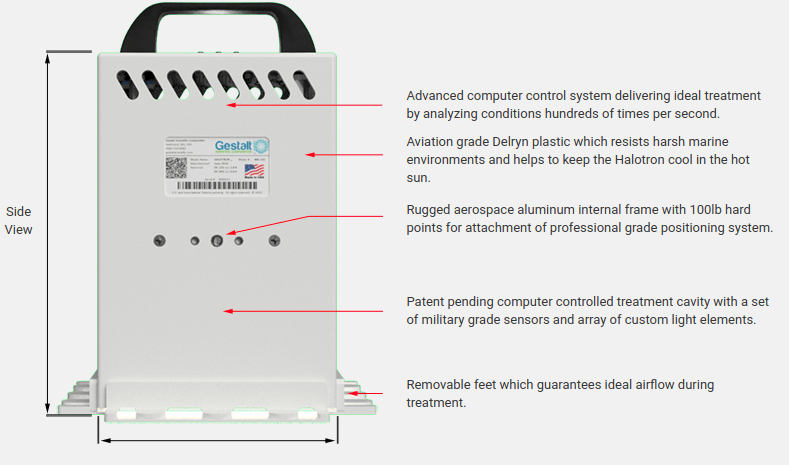 If the defect is Gestalt Scientific’s responsibility, the customer will be furnished with a replacement unit. User-inflicted damage is covered with a partial credit towards a replacement unit. After one year, all claims will be handled on a case-by-case basis at the discretion of Gestalt Scientific. 30 Day Performance Guarantee: We give our customers a full 30 days to try our products out, to make sure they meet and exceed expectations. If for whatever reason the customer is not happy with the product they can return it, undamaged, for a refund. U.S. and Canada customers can choose between Standard (5-7 day shipping) and Expedited 2 or 3 day shipping. International customers have a variety of shipping options available depending on their locale.